U2 picked up two Billboard Music Awards today, both announced as part of the non-televised portion of the awards ceremony. U2's awards are both for the success of The Joshua Tree Tour 2017 last year. In the Top Rock Tour category, they beat out Coldplay and Guns N' Roses. 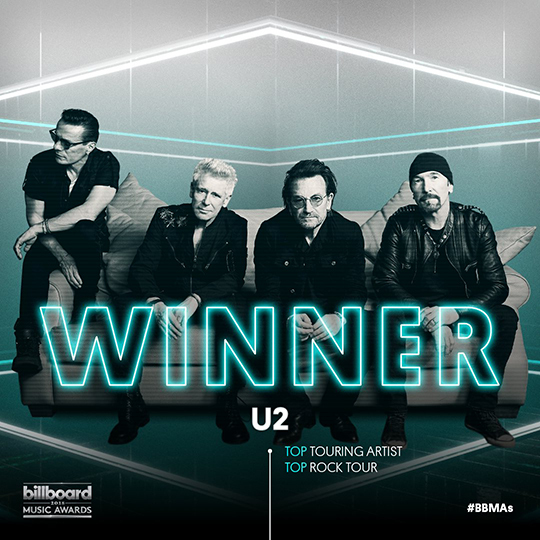 In the Top Touring Artist category, U2 beat out those two bands plus Ed Sheeran and Bruno Mars. U2 was nominated in two other categories but didn't win. Top Rock Album and Top Duo/Group both went to Imagine Dragons. Here's the full list of winners. The televised awards show airs tonight from Las Vegas on NBC.